For Big Sister's sixth birthday, we had her very first party with friends. 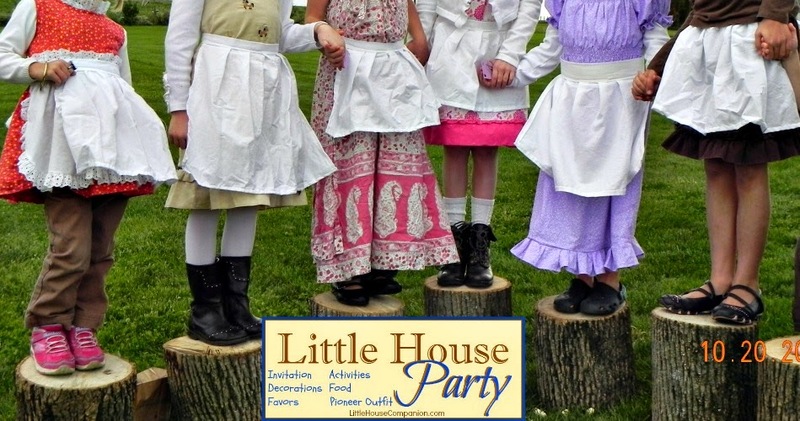 She had been enjoying the Little House books by Laura Ingalls Wilder for years, so I included a Little House theme as an option for her birthday party. She decided upon a Little House themed party, and I had a blast planning pioneer activities, food, and more. Laura Ingalls Wilder was born on February 7, 1867. Almanzo Wilder was born the same week, ten years earlier on February 13, 1857. 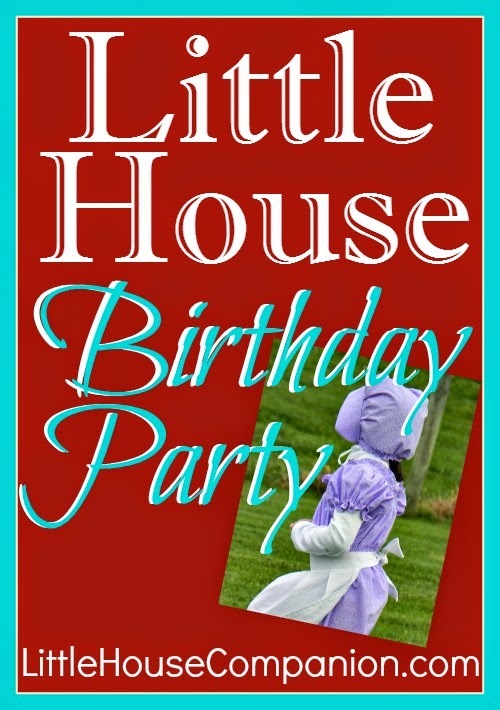 Their birthdays make this the perfect week to finally share more about our own Little House birthday party. Upon arrival, the prairie party guests climbed, walked, and balanced on the tree stumps. When everyone had arrived, we gathered for popcorn and the picture book Winter Days in the Big Woods (affiliate link). Though all of our guests knew about the Little House books, I still felt it was important to provide a fresh reminder of pioneer life. The popcorn was served in paper bags. After story time, Big Sister passed out the homemade pioneer aprons so the girls could get to work. 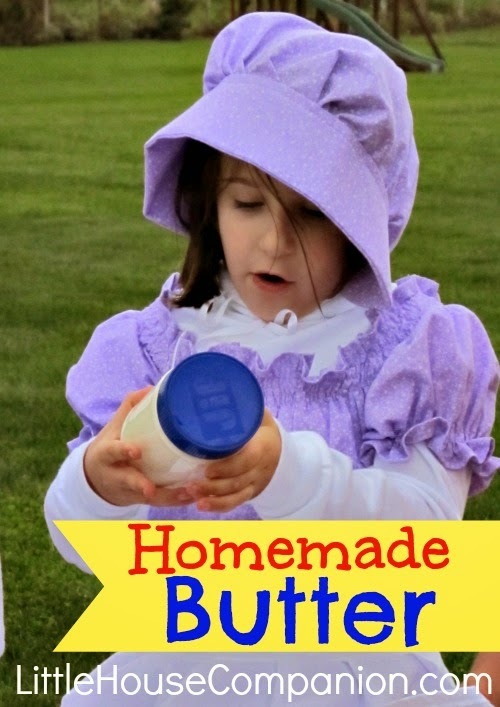 We made homemade butter-not quite pioneer style. I instructed the girls to shake until they were tired and then to pass it on to a friend. While shaking the homemade butter, we continued to work. We gathered vegetables-pioneer style. 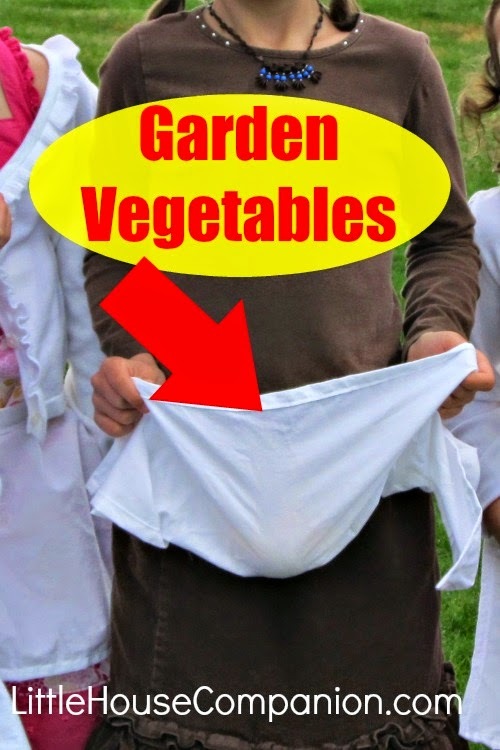 Prior to the guests' arrival, I scattered potatoes, onions, carrots, and sweet potatoes throughout our flowerbed to create the "vegetable garden." I wrote more about the Little House garden harvest. See that link for details. Then it was wash time-pioneer style. A wicker laundry basket full of laundry "needed" to be washed. I had collected enough washcloths for each guest to wash two. If I were to do it again, I would provide enough laundry so each guest could have three or four turns. The washboard was most popular pioneer activity of the party. 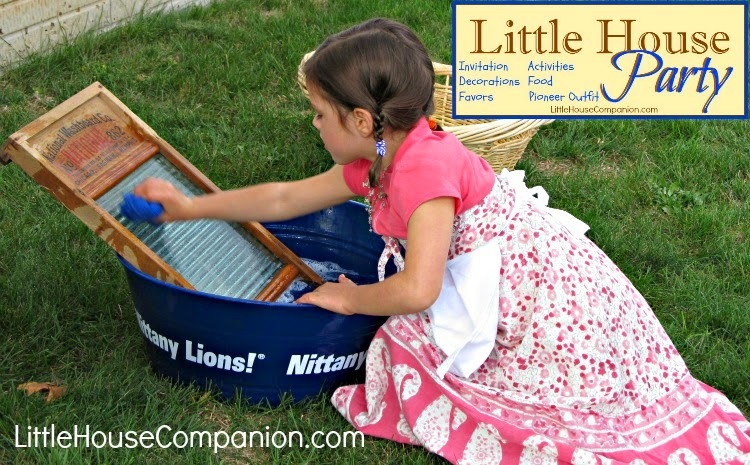 Washboard laundry are also a huge hit during my pioneer presentations with all ages. The Little House party guests shopped- pioneer style. 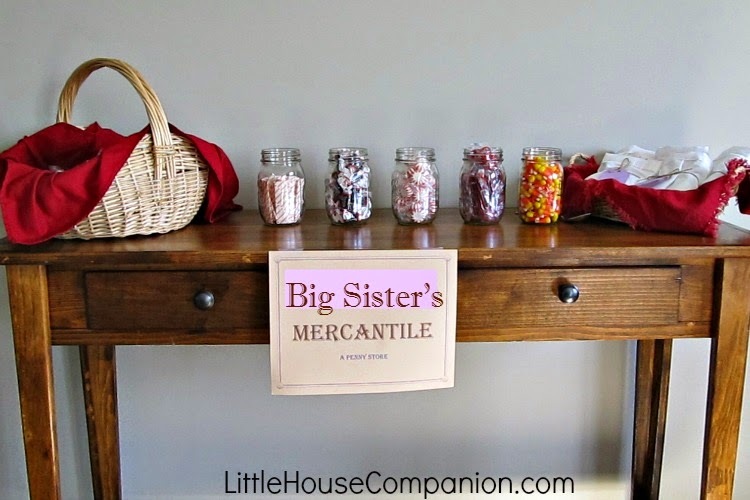 We went inside to shop at Big Sister's Mercantile. Big Sister managed the penny store. I will share in more detail soon of how she "sold" nineteenth century candy and popcorn balls to the party guests. The party then remained inside for warmth and hot chocolate. The little pioneers enjoyed their butter on crackers. We feasted upon the prepared pioneer party food which I will blog about soon. Big Sister broke the cake tradition for a pioneer treat. We wrapped up with some fiddle music and a bit of dancing. We may have used a CD player for the music, but the guests were having too much fun to notice. The pioneer party guests asked for more work, more food, and more dancing before departing in their covered wagons. Big Sister presented each girl with their brown shopping bag from the mercantile. The party guests wore their pioneer aprons home. 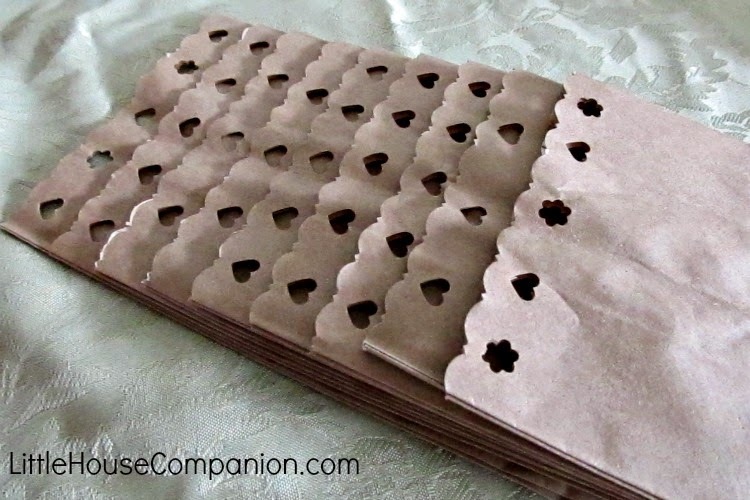 Another option is to use the Little House Garden Game and have the party guests complete the game in pairs or teams or let them take it home. It could even be completed on poster board with the teams in two different rooms or under two different trees in the backyard. If the party guests know the books well, you could prepare with the Little House in the Big Woods Discussion Guide for some good conversation. 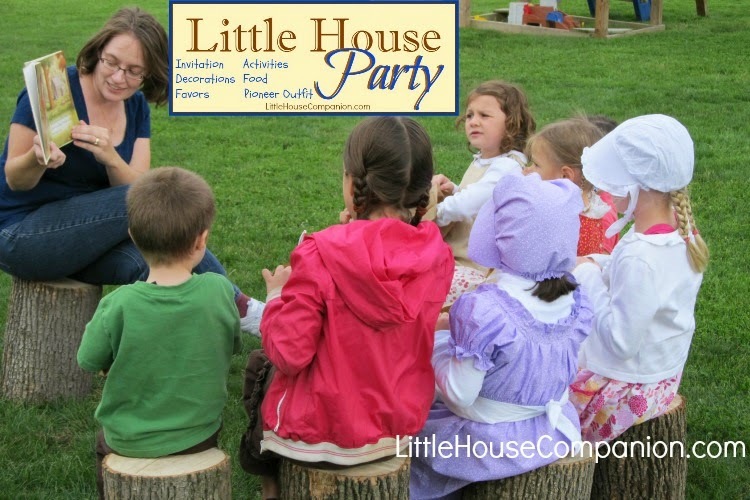 Our Little House pioneer birthday party activities were lots of fun for Big Sister and her friends.